Start this Spring off with a bang and score some free gift cards! 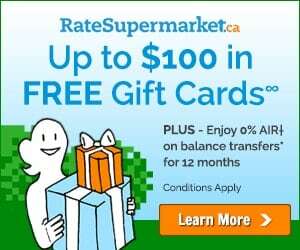 RateSupermarket.ca has a fantastic promotion going on right now that reward you for the money you spend. The best part is that you get to choose your own rewards! Sounds cool right? RateSupermarket.ca is giving away FREE $25 gift cards to everyone who is approved for one of their two promo credit cards on their site. For the gift cards, there’s over 50 popular retailers you can choose from . Then, once you spend $150 on your card within 60 days of your account approval, you’ll receive another FREE $75 gift card! The cards featured in this Spring promotion both sound pretty sweet! The MBNA Smart Cash MasterCard® Credit Card offers up to 5% cash back on gas and grocery purchases while the MBNA Platinum Plus® MasterCard® credit card lets you enjoy 12 months with no interest on balance transfers and deposits. There is no annual fee on either card as well. If you are shopping for a new credit card, take advantage of this special promotion! It expires on April 30, 2014 and you can find more details and apply on RateSupermarket.ca. If you aren’t sure which credit card is right for you, you can crunch the numbers with RateSupermarket.ca Credit Card Rewards Calculators. It will compare your current credit card with one of the featured credit cards in the promotion and show you how much money you’ll save by switching. It will also give you a better idea of which card is best suited for you. Visit RateSupermarket.ca to learn more and to apply. Which gift cards will you pick? Thanks for the information on this, I am not in the market for a new credit card so I won’t be taking advantage of it but I am sure there will be others interested in it. I love my Walmart MasterCard. Its only 1%, but that includes the cable/cell/internet/phone bills that go onto it, and the large purchases like insurance for my home and vehicle. This is a great promotion, but a credit rating is gold, and signing up for another card for the promotion can work against you in the long run I have been warned. For those looking for a first card, the promo on this one may be worthwhile. Free gift cards? Sounds like a deal too good to pass up! I always try to wait for promotions like this, it’s amazing what you can get free for signing up for things at the right time. I love these type of promotions. I didn’t know about this one.